Cadillac: Dinged by platform issues with the Escalade SUV. New transmission systems designed to boost fuel economy and infotainment proved troublesome for the auto industry this year, with Acura and Cadillac taking the biggest falls in Consumer Reports’ 2015 Annual Auto Reliability Survey. Lexus was the top brand again as Japanese brands set the pace with five companies in the top 10. Ford was the biggest gainer of the year, moving up six spots to 17th place thanks to strong performances by the redesigned F-150 and Expedition SUV. “Ford launched a lot of new products not too long ago,” Jake Fisher, Consumer Reports’ director of automotive testing, said in an interview. Toyota followed Lexus in second place, while Audi ranked third as the top European brand, Mazda came in fourth and Subaru was fifth. Buick, in seventh place, was the only domestic brand in the top 10 for the second year in row. Acura and Cadillac both dropped seven spots to 18th and 25th place, respectively. Acura owners had issues with in-car electronics and transmissions in the newest RLX and TLX sedans, while Cadillac was dragged down by its CUE infotainment system. "Cadillac’s product development experts are analyzing this data, along with other information we have [from] owners, as part of the ongoing elevation of our product portfolio," a Cadillac spokesperson said in a statement to Automotive News. "There are significant upgrades to 2016 models in production now, including enhancements to CUE such as faster and more powerful system response and the inclusion of Apple CarPlay." 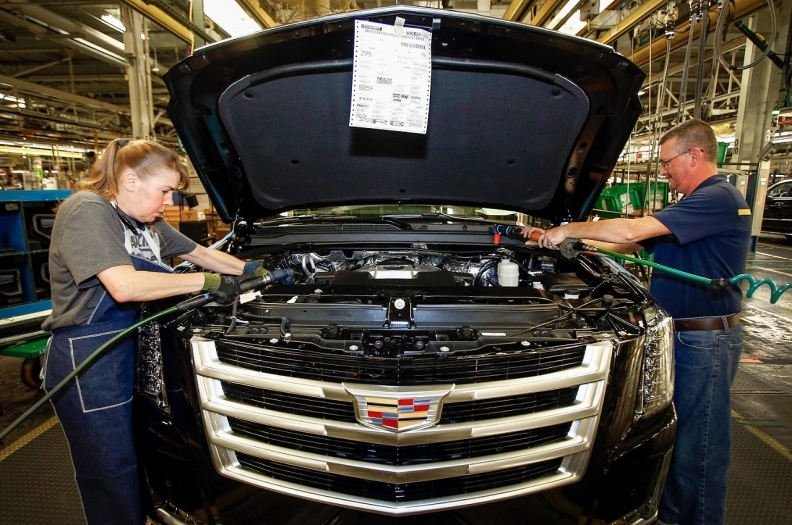 Consumer Reports said Cadillac also was dinged by platform issues with the Escalade SUV. Things weren’t smooth for every Japanese brand. Honda dropped four spots to eight place this year due to infotainment glitches in its redesigned and freshened vehicles. Infiniti also dropped four spots as problems continued with its InTouch infotainment system. Typical infotainment malfunctions people experience include system lockups and screen freezes. Infotainment problems sometimes require replacement components to fix, Fisher said. The Tesla Model S had a worse-than-average predicted reliability score with problems stemming from the drivetrain, power equipment, charging equipment, center console, body and sunroof squeaks, rattles and leaks. The magazine, citing reliability issues, said it no longer recommends the Tesla Model S even though it is the magazine's top-scoring vehicle in road tests. Following the release of the report, Tesla shares fell as much as 10 percent, and closed down 7 percent to $213.03. "Consumer Reports also found that customers rate Tesla service and loyalty as the best in the world. Close communication with our customers enables Tesla to receive input, proactively address issues, and quickly fix problems," a Tesla spokesperson said in a statement to Automotive News. "Over-the-air software updates allow Tesla to diagnose and fix most bugs without the need to come in for service. In instances when hardware needs to be fixed, we strive to make it painless." 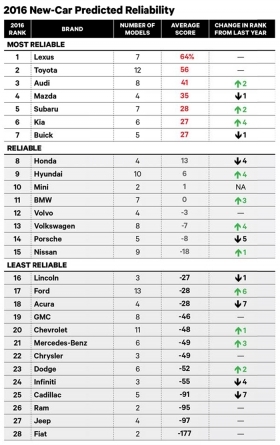 After Ford, the largest improvements came from Kia, Hyundai and Volkswagen --with each brand moving up four spots. German rivals BMW, in 11th place, and Mercedes-Benz, in 21st place, each bettered their rankings by three spots. Audi, Dodge, in 23rd place, and Subaru each gained two spots in the rankings. Nissan, in 15th place, and Chevrolet, in 20th place, each improved by one spot this year. Consumer Reports says Audi and BMW each have reliable dual-clutch transmissions. The continuously variable transmissions in Honda and Toyota hybrids are “strong performers” as well, according to Consumer Reports. Ram, Jeep and Fiat finished in the bottom three spots respectively, prompting their parent Fiat Chrysler Automobiles to put out a statement.